This father’s day, we made it a family event at the fantastic five brunch at Park Hyatt and I realised it was the perfect option for families. Our family is a melting pot of food preferences ; while my mother in law is all about experimenting and experiencing anything that she doesn’t cook at home, my father –in- law prefers the home cooked Goan staples of rice and curries. The husband is keen on healthy grills and dry meats, I am all about the indulgent desserts and cheese boards. So when Park Hyatt Resor and Spa announced the launch of their 5 distinct culinary experiences, in the form of their 5 speciality restaurants coming together under one massive epicurean experience, I knew it was the perfect fit for the two fathers for father’s day. The brunch is not your average, multi cuisine spread, or even dining in a multi cuisine restaurant, because this is about 5 distinct kitchens, 5 separate teams taking care of the cuisine they do best. And so Casa Sarita, the Goan Soeciality restaurant morphed into the Goan Priestess, Da Luigi the Italian speciality restaurant morphed into the Italian Empress, Palms the sea facing grill speciality restaurant came dressed as the sea food emperor, Masala the Indian speciality restaurant became the Indian Magician, and village café turned into the street style star. The cheese and charcuterie grazing platter, a sight to behold. The gorgeous Park Hyatt property, which offered father's day games art art work for kids, play area and bonding activities and plenty of open spaces to run around. The customary mom and baby cup of cheers with our tea cups. Each of these desserts signified us as a family, the flamboyant blue and white with a base of brownie is me, the clean classic chocolate bar , the husband, and that adorable tart which stole my heart has got to be the apple of my eye, my son. The fantastic five brunch is a first of it's kind concept meal by the resort, and I think it's a fantastic move, in that it showcases each of the speciality offerings in a stellar manner. we loved the prawns grilled on open flame, the chicken dimsums , and the tava mutton in this monsoon season, and judging by the fantastic turnout of people, this concept biffet lunch is going to be a sizzling success all through the rainy season. If you cant make up your mind if you want fish curry rice, or a grilled chcken and roast potato kind of meal, or a wok tossed noodles and creamy pasta dish, then decide to have it all at the newly launched sunday brunch for the monsoon season at Park Hyatt. do call in advance and book your tables though, because this one is extremely popular . So you plan on visiting Goa in the rains, but still want to visit quirky and cute places, with instagrammable food, which is good for you, also meet other people, collaborate on projects and soak in the artsy vibe of Goa in the monsoons. Three cafés which are open during the monsoon season in Goa, where you can come in to dry yourself off, do a spot of shopping even, eat some gorgeous food, and who knows even make a local connection . The project Café , Assagao. Imagine a 130 year old Portuguese Villa housing a lifestyle experience space, with Food, design, retail, and gallery space. The restaurant/café within this art gallery like space, serves up some vibrant and fresh salad, like the fig and blue cheese crumble salad we loved, and also south east Asian cuisine like a thai green curry. But we loved their rendition of Serradura the most, with dessicated coconut crumble, and creamy biscuity bits to add to the wonder. What’s exciting? The outdoor café which is inspired by Bismarckia leaves, notice the leaves marked on the concrete tables, and a giant mural on the wall of the tree as well. Millennial travel goals: The project café loves to collaborate with skilled travellers, and we have attended a pop up with a travelling chef couple from Lisbon, as well as a watercolour travel journalist from Berlin, and a visit to project café could lead to connecting with interesting people from around the world doing interesting things on the sphere of art, design , food and more. Infact you can reach out to them if YOU want to do a workshop or an exhibition as well. A café restaurant which believes in Organic food, enough to not serve any chicken or meats, because they may not be sourced from organic farms. But trust me, you don’t miss the meats. They do serve fish, and the tuna and avocado salad is amazing. Between instagram worthy smoothies and shakes, and fresh organic sourdough bread and gluten free banana cakes, there is much to choose from. Whats exciting? All through monsoon, you have movie nights, and also there is a lovely book library overflowing with books, so that you can cozy up in a chair with a book, and watch as the rain washes of the beautiful green trees in the area. Kids also have a tree climbing play area, and a place to enjoy nature and the monsoons while you can keep a watchful eye from your cozy corner. Millennial travel goals: A large Yoga and pilates area, a mixed martial arts area, a shop filled with quaint India inspired curios and jewellery, which is all very affordably priced to take back as souvenirs from your travels. Most of the belts and handbags are made in house, and are all unique bespoke pieces. A white Goan Potuguese home, nestled in a wooded garden, is home to one of the more popular natural food movements in North Goa. A menu teaming with breakfast bowls and healthy superfoods, like Kombucha, acai berry smoothies, granola trail mixes, not to mention lactose free nut milks, and gluten free desserts which will have you weak at the knees, but healthy in heart and gut. quinoa salad, acai berry smoothie bowl, kombucha , hummus falafel mezze platter. all so instagramable and all so deliciously good for you. What’s exciting? An Natural food store, which even has environment friendly detergent soaps for your clothes and home washing purposes. Throwback to Indian ethos of care and nurture, they store and sell, unique health foods like apple cider vinegar from Himachali apples, and organic indian spices an oils and organic milled grains, apart from your nuts , and granola trail mixes. Millennial travel Goals : At the time we went, young Caroline from Canada was painting a magical garden of cornflowers and dragonflies on the dried leaf walls of Natti’s Natural. A chance to work and share your skill, while you travel and experience a country , is an exciting prospect to the millennial traveller. And we loved connecting and interacting with this effervescent soul who was visiting India to learn Yoga. Monsoons are the perfect time to travel to Goa if you are looking for the offbeat, the economical, the slow paced travel. 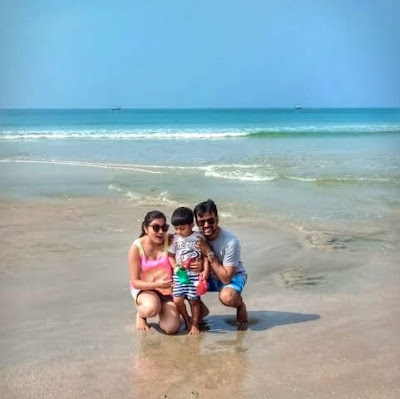 If you are looking for an immersive travel and food experience , then I hope this post helps you get the most from your #monsoonsingoa experience, also if you are a local Goan, then this would be the best time for you to get to know the hippy chic travel lifestyle of the world travellers and what makes Goa such a hotspot for millennial travellers. If you liked this post, I would really appreciate that you shared it on your social media.